Nylon is a versatile man-made material that is used to manufacture rain, sport and winter coats. Although it can repel rain and help keep your body dry during a snowstorm or torrential downpour, nylon isn’t impervious to staining. Staining on and along your nylon jacket’s cuffs is a common issue simply because the area is constantly exposed to food, dirt, mud and anything else you touch or handle throughout the day. Before laundering your nylon jacket, pretreat the stained cuffs with the proper store-bought product. Place the coat on a sturdy hanger. Cover the cuffs only with a heavy coating of aerosol pretreater. Allow the pretreatment to penetrate the stain for at least one hour. If the pretreatment drips, lay a hand towel or paper towel on the ground to prevent creating a mess. 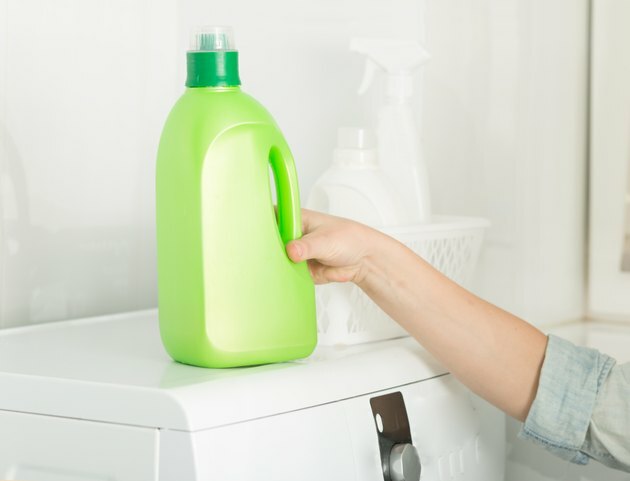 Create a mixture of 1/2 gallon cool water and 1 tablespoon liquid laundry soap. Remove the coat from the hanger and submerge one of the cuffs in the soapy liquid for one minute. Lift up the cuff and work in the soapy water with a plastic scrub brush. Repeat the process with the second cuff. Rinse the soapy mixture from the cuffs and allow them to dry. Examine the cuffs and, if any staining or discoloration persists, repeat scrubbing them with the soapy water. Rinse the soapy water from the cuffs and allow them to dry. Launder the nylon coat according to the label's directions. If the stain isn’t removed with the pretreatment and laundry soap, follow the recommendation of the Oregon State University Extension: cover the affected area with a light coating of oxygen bleach before briefly submerging the cuffs in hot water. Launder the coat according to the label’s directions immediately after removing the cuffs from the hot water.